Email id is needed when we want to create Facebook Id but we hide this email for various reason.So when we want to see my friends email id most of the time we are unable to see that. 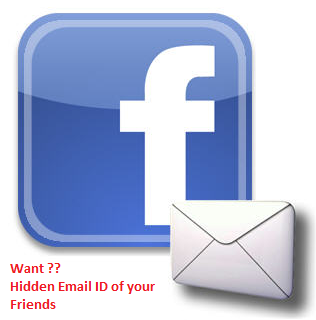 for that reason or recover this problem today i share a tricks that easily find out your friends Facebook hidden email ID. 01. At first you need a yahoo account. 02. Now link your Facebook id with yahoo account. 03. Never log out your Facebook account & open a new tab- enter your yahoo account giving email & password. 04. After that go to the contacts tab & now click on import contacts and click on Facebook icon. 05. Here a new pop up windows appear "Do you want to share your contacts with yahoo?" now click on ok button. 06. Your work is almost done just click on "view imported contacts"
07. Now see your Facebook friends Hidden email id.